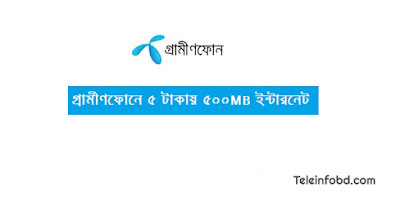 Grameenphone the largest Telecommunication company in Bangladesh brings another 'Bondho Sim Offer' 500MB Facebook Interent 5 Tk.Customers are eligible to use 500MB Internet for Facebook Browsing. How to check you are eligible 'Gp Bondho Internet Offer' or Not? Eligible GP customers will get 500MB facebook internet at 5tk. customers can buy this pack maximum 1 time only! Tags: grameenphone reactivation offer, gp bondo sim offer 500mb 5tk, gp 500mb@5tk bondho internet offer.grameenphone silent sim offer.